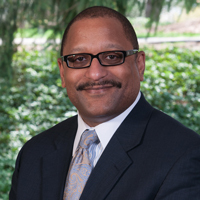 Louis P. Barbarin, CPA, initially joined MMBB’s staff as assistant treasurer and has since served as treasurer, CFO and deputy executive director before assuming the role of executive director. Prior to joining MMBB, Louis served as the deputy executive director and treasurer of the American Baptist Board of Education and Publication. Other experiences include serving as controller and acting vice president of finance at Cheyney University of Pennsylvania and a professional career at the accounting firm of KPMG. Louis holds a Bachelors of Science in Accounting and a Masters in Finance from The Pennsylvania State University and has completed Harvard Business School’s Advanced Management Program. He is licensed as a certified public accountant in the states of New York and Pennsylvania. Louis currently serves as chair of the Interchurch Center Board. He also serves on the Board, Finance and Pension Committees of the Kendal Corporation, a network of continuous care retirement communities that provide housing and other services to its residents. Prior volunteer experiences include Habitat for Humanity of Chester County, The American Baptist Foundation, ABCON Credit Union and Trinity Press International.